Banbury United manager Mike Ford was full of praise for his side after they booked their place in the next round of the FA Trophy. 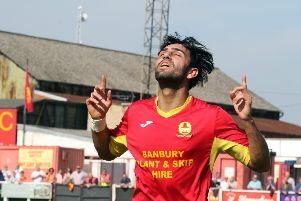 The Puritans won 3-1 at Yate Town in Saturday’s preliminary round tie thanks to second half goals from Ricky Johnson, Callum White and new signing Nicholas Kalakoutis, who opened his United account, before Harry Horton grabbed a late consolation. United now travel to Evo-Stik Southern League premier division outfit Hungerford Town for the first round tie later this month. Ford said: “We’ve come to a side which I still think will go up or even win the league and given them a lesson in the second half. “They caused a few problems in the first half and we had to change our shape at halftime. We had to defend well in the first half because they had plenty of the ball but we kept a clean sheet and that was so important for us to go in on level terms. “Goals change games and once we scored we won it quite comfortably in the end, although it was disappointing to concede late on.